These mackerel fillets from John West were seasoned with cracked black pepper, which sounded perfect for a healthy peppery lunchtime fishy treat. It stated on the tin that these Peppered Mackerel Fillets can be eaten hot or cold, so I went for the traditional eat it fresh out of the tin method. I'd shook the tin before opening and took note of a slight slosh. You never know how dangerous one of these peel-back tin lids can be, so I opened the tin over the kitchen sink perhaps being a little too over cautious. I was rewarded with a very fishy mackerel smell on opening and none of it on my clothes. That's the goal of all food intake of course; in my mouth not on my clothes (so often not the case if I sit on the sofa watching TV with a tray of "messy" food)! Once I'd sat down to eat the initial uber fishy mackerel smell had calmed down a little, but I still figured I wouldn't be gaining any kisses that afternoon. I could see crushed black peppercorns on the top of the fish fillets. Black pepper was present in the succulent mackerel taste, which left a warm tingle on my tongue and tickled the back of my mouth. This was certainly not a dry fish fillet experience, as the sloshiness in the tin was a little brine in the bottom, which gave these Peppered Mackerel Fillets a lip-smacking saltiness. I found these Peppered Mackerel Fillets a perfect healthy afternoon snack whether with lunch or inbetween meals. I preferred them on their own in the can, as I often do with this type of fishy treat, but I can see there would be a lot of potential for salads and hot meals also. Just don't forget to brush your teeth afterwards if you want that kiss! John West was established in Liverpool in 1857. 110g peel-back tin at 249 calories, with 17.6g of fat and traces of sugar. 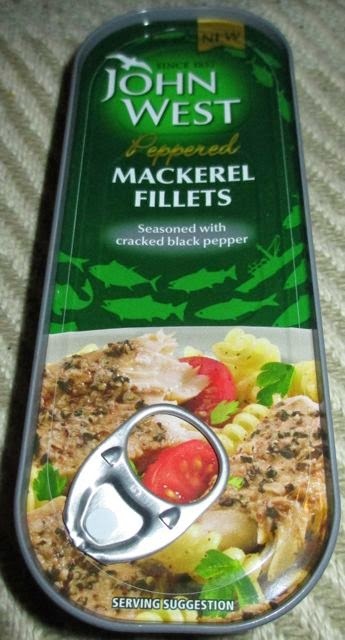 Ingredients included; mackerel fillets (98%), crushed black peppercorns, and salt. Although care is taken in preparation some bones may remain.